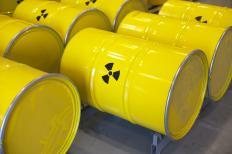 A hazardous waste facility is any location where waste products are stored, disposed or treated. These three functions normally happen at separate facilities and each requires different tools and techniques. Storage consists of temporarily warehousing waste, normally in containers or tanks, until it can be processed. Disposal facilities find a permanent way to get rid of waste, often burying it safely in the ground. Treatment centers attempt to either neutralize the waste of its harmful qualities or use it for energy purposes. A hazardous waste facility that specializes in storage is a dangerous, but necessary, element of this process. Hazardous waste storage is mostly done in containers, like sealed metal oil drums, that can house industrial byproducts, toxic materials and other dangerous elements. Large quantities of hazardous waste can also be stored in a tank, like a train tank or tanker truck, so it can be easily delivered to the processing facility. Liquid waste can be stored in secure, man-made ponds called surface impoundments. Also, highly dangerous material that should have a minimum of human contact is often stored in sealed containment buildings that lock out weather elements and human access. When toxic elements are permanently removed from human and natural contact, they are housed in a hazardous waste disposal center. This type of hazardous waste facility is usually a special type of landfill. At these sites the ground is lined with plastic or cement to prevent seeping into the soil. Waste is often left in its container and covered with soil or cement to prevent it from contaminating the environment. Disposal is seen as a last resort for much hazardous waste, because there are several methods used to treat waste to either neutralize it or recycle it. A hazardous waste facility that specializes in treatment can perform a number of different duties. Neutralization is a type of hazardous waste handling that eliminates the toxicity of a substance, like adding a basic element to an acid to make it harmless. Incineration is another technique that introduces the hazardous material to extremely high temperatures, like in a furnace or boiler. The intention is to burn the waste until it is no longer harmful and also use the waste as fuel for energy creation. This method can often lead to toxic byproducts in the exhaust, so pyrolisis is an alternative. A hazardous waste facility using pyrolisis incinerates waste using an electrical arc in inert conditions that eliminates harmful byproducts.